The International Compliance Assurance Programme (ICAP) is a voluntary programme that will use Country-by-Country reports and other information to facilitate open and co-operative multilateral engagements between MNE groups and tax administrations, providing groups willing to engage actively and in a fully transparent manner with increased tax certainty. By coordinating conversations between a group and tax administrations in several jurisdictions, ICAP should ensure a more effective use of transfer pricing information, a more efficient use of resources both for groups and for tax administrations and, in the longer term, fewer cases entering into mutual agreement proceedings. This handbook contains information on a pilot for ICAP, commencing in January 2018, including tax administrations from eight jurisdictions: Australia, Canada, Italy, Japan, the Netherlands, Spain, the United Kingdom and the United States. 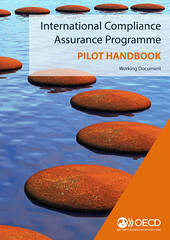 The handbook is a working document and its content will be revised, based on experiences gained in the pilot, and used as the basis for the development of an ICAP operating manual, which will describe in detail the programme and the processes to be applied beyond the pilot.